Cologne Old Town "Home of the elves"
The city of Cologne offers seven Christmas Markets in total. Among them are four big Christmas Markets located at the Cologne Cathedral, on the Alter Markt, on the Neumarkt and on the Rudolfplatz. Every year these wonderful four Christmas Markets attract almost 2 million visitors. The Christmas Market at the Cologne Cathedral is the most impressive one in Cologne, due to the huge backdrop of the imposing Cathedral. Beneath the Cathedral and the largest Christmas tree in the Rhineland you can find well over 160 festively designed wooden pavilions. 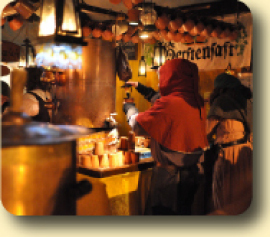 Here you can watch artisans at work, enjoy original “Christmas Mulled Wine”, out of festively decorated Christmas mugs or you can choose from an unlimited choice of sweets and local delicacies. The Christmas Market on the Alter Markt takes lace in the heart of the Altstadt (Old Town) and in front of the Old Cologne Town Hall, which is only 200 metres away from the Cathedral. 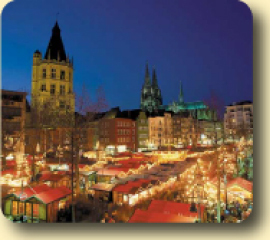 For many years this Christmas Market has been attracting young and likeminded people to Cologne from all over the World. Shadowed by beautiful narrow-gabled houses and half-timbered stalls, the Christmas Market on the Alter Markt conveys a very romantic and idyllic feel. Children especially will find lots to do here; a nostalgic children’s roundabout, a puppet theatre, a Santa Claus’ grotto and many toy stands, all providing endless fun and entertainment. According to an old Cologne legend, this is were the famous “Heinzelmännchen” gnomes are said to be responsible for all this Christmas splendour, carefully observing the Christmas proceedings and preventing any mass made or modern goods from being sold. 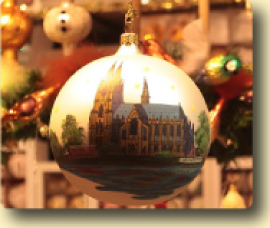 The Neumarkt Christmas Market is Cologne's oldest Christmas Market, it is curiously located on the "New Market" amidst the backdrop of St.Aposteln’s Church and Cologne’s main shopping area. As in previous years, the Angels Market glows in pre-Christmas splendour with charmingly designed chalets and a unique “stars at night” theme. Visitors will be enchanted by glamour and high-quality products. Set against the historic backdrop of Hahnentorburg, one of Cologne's three mediaeval gate houses, the Christmas Market on the Rudolfplatz takes you to a world of brother’s Grimm fairy tales. Large fairy tale figures and festive illuminations provide a special eye-catcher, especially for children. Besides the four big Christmas markets there is also a Cologne Harbour Christmas Market, located at the Chocolate Museum. 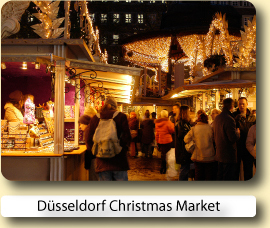 The new Cologne Harbour Christmas Market is showcased by picturesque surroundings. Located near to a medieval Malakoff-Tower, Swing Bridge and Cologne’s popular Chocolate Museum, the historical harbour is a splendid location for a perfect Christmas Market. Modern and elegant, with about 80 white marquee pagoda tents and roof peaks, like ship sails, this Christmas Market aims to inspire a nautical theme. Offering high quality art products, and culinary delights from all over the world, as well as a colourful programme; with pirates, shanty and Christmas stage performances. The Harbour Christmas Market will entice anyone to stay for a tasty mug of mulled wine. Also well worth seeing is the Stadtgarten Christmas Market, a fairly large Christmas Market, located on the edge of Cologne's oldest park. The Stadtgarten Christmas Market has a far more relaxed and village like atmosphere and is, apart from the traditional local food, arts & crafts, a great choice for children's entertainment or any one young at heart. As Christmas approaches there are plenty of things to do and attractions through out Cologne, including a variety of Christmas Concerts, Nativity Scenes and a huge temporary ice rink on the Heumarkt. 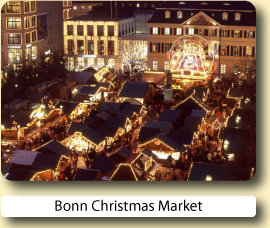 The seventh Christmas Market, the “Christmas Avenue” is a completly different kind of Christmas market! Colognes gay and lesbian Christmas market is located in the centre of the “scene-quarter”, a Bermuda Triangle near the Rudolfplatz. The market offers quality products, culinary delights and especially cabaret and shows in a sparkling and atmospheric ambience. Everyone is welcome here to celebrate the wonderful Christmastime together. Getting to Cologne couldn’t be easier. Journey times from London to Cologne, via Brussels with Eurostar are only just over 4 hours and there are plenty of airlines with flights to Cologne/Bonn airport, making it even easier to enjoy a real German Christmas Market in Germany. The city's very name bears witness to its Roman past as the town of Colonia. As well as the legacy from Roman times and the Middle Ages, particularly the world-famous cathedral, Cologne has an extremely lively arts and culture scene. And besides being a centre of carnival activity and the "capital of Rhenish joie de vivre", Cologne is also an extremely attractive shopping centre. Open, friendly and uncomplicated: that's Cologne! Cologne is an exuberant and contrast-packed city with something for night owls and culture fans alike. Dominated by its mighty cathedral, Cologne is Germany's fourth largest city offering a very interesting contradiction of historic and very modern. 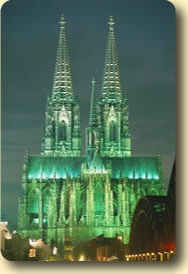 The Cologne Cathedral - with its two 157-metre-high towers and a designated UNESCO World Heritage site - has been the city's most famous landmark and Germany's most famous architectural monument for centuries. It took 632 years for Germany's largest cathedral to be completed. 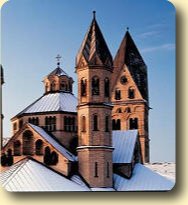 The cathedral is one of the most important pilgrimage churches in Europe, attracting visitors from all over the world. Cologne is also an ideal base for rail or Rhine steamer excursions, or why not treat your kids to a visit to the nearby theme park, Phantasialand, which is open during the festive season and also has its own Christmas Market on site. Excellent hotel in brilliant location right opposite the cathedral and within a short walking distance of railway station. A beautiful hotel in a great location. 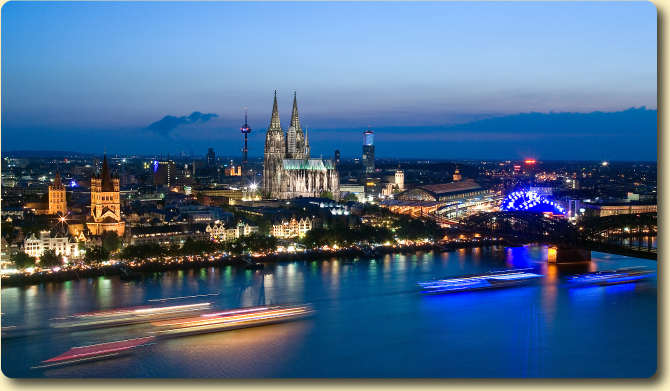 The Hyatt Regency Cologne has awesome views of the Rhine river and the Cologne Cathedral. Buy a one day German Rail Länder Ticket and you could explore all the Christmas Markets in the state of North Rhine-Westphalia for one amazing price of: One passenger: €41 Extra person: €0 Unlimited travel, one price, through out North Rhine-Westphalia (see map above) for up to 5 people, 9 a.m. until 3 a.m. of the following day and on Saturday, Sunday and bank holidays from 0a.m. until 3 a.m. Valid on all local trains (Interregio-Express, Regional-Express, Regionalbahn, S-Bahn). Prices quoted are for 2017 ticket machine purchases only. Rich in antiquity, museums, art galleries, theatres, restaurants, and animated bars—visitors to Cologne are certainly spoilt for choice. Make the most of your visit with a convenient city card, offering many discounts as well as free travel on public transportation. Discover Cologne the hassle-free way—onboard a comfortable coach. Informative commentary draws attention to celebrated sights along the historic streets. 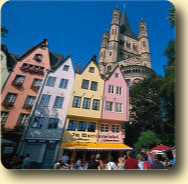 Take a cruise down the Rhine River to see the beautiful Roman city of Cologne. In addition to the picturesque Old Town and enchanting waterfront, commentary is provided to point out the city's other attractions. 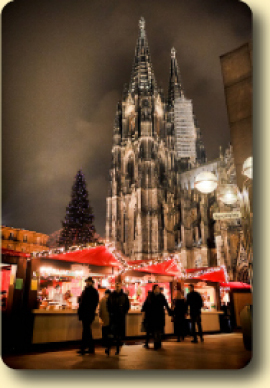 Book your hotel for the Cologne Christmas Market with Expedia or Hotels.com.Both online reservation services will let you compare and book hotels at great low prices.